The Group began "playing for keeps" with orders to take out a railroad bridge near Mulhouse, France, located near the Swiss and German borders. The men were cautioned during their briefing to take extra care in identifying the target. Earlier, on 30 April, the Mighty Eighth had accidently bombed Switzerland. Needless to say, the Swiss government was furious and some elements of the Swiss Air Force began taking revenge by attacking crippled bombers seeking a safe haven. According to the official summary, 30 planes were dispatched. The plan was to form up in three sections, but during assembly the Group was interrupted by a B-17 group. The 492nd was split equally into two sections, one with Col Snavely as Mission Commander and the other under Lt Col Adams. The two sections were not able to find each other over England. Snavely took his half and hooked up with the other groups in the 14th Wing. Adams' half formed up with another group in a different wing. As a result, each section has a different story for this mission. In recreating the formations used on this day, we made two seperate pages to show that these two sections flew seperately. The original formation sheet shows both formations on the same page. To see how they formed up that day, see the Assembly and Attack Formations located in the links at right. Both sections say they had excellent fighter protection all the way to target, escorted by P-38s, P-47s and P-51s. Light flak was encountered as the Group entered France. Although some of the ships were hit, there was no serious damage nor were any casualties inflicted. But the first mission also meant this was the first flak encountered by the men. Needless to say, the reality of war was beginning to sink in. There were people down below trying to kill them. Although the Group was not challenged by any enemy aircraft, they did see them. Some reported watching dogfights near Paris while others saw German fighters attacking other group formations. They fully realized that there were people in the air trying to kill them, too. The 492nd had beginner's luck. On this day, the Germans downed 8 B-24s and 5 fighters from the 2nd Air Division. Another 47 were seriouly damaged. The B-17s took some licks too, as they lost 8 bombers and 4 fighters on their missions. In return, the Luftwaffe lost 21 fighters. 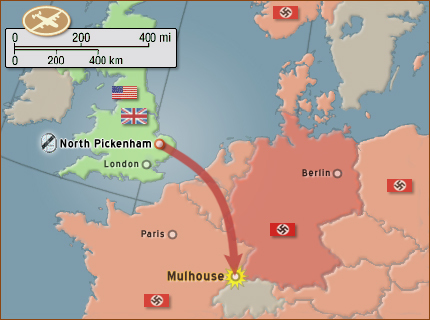 When the Snavely section reached the IP (Initial Point when the bomb run begins) for target, Smith informed Snavely that they were not approaching Mulhouse, their intended target. Snavely held off the bombing and ordered his section to circle around while Smith double-checks his navigation. The other two groups in the 14th Wing went ahead and dropped their bombs and headed for home. They circled the target area again and then again. Smith insisted that was definitely not Mulhouse. Finally, Snavely correctly decided to scrub this target and led his group to their secondary target, the marshalling yards at Auxerre. Each plane was to look for targets of opportunity along the way. Each plane has their own story. Munson said that when his section got to target they saw the Snavely section circling about the target and wondered why. His navigator assured him they were over Mulhouse. The Adams section dropped their bombs along with the group to which they were attached. The return trip home became seriouly critical. The scheduled mission had already gone deep into enemy territory. With the extra time spent hunting for the primary target and then running off to a second, the planes were running dangerously low on fuel. Two of them did run out! Capt Uebelhoer lost an engine on LITTLE RED as they began crossing the Channel. This further increased his fuel consumption. The ship did get across the water, but soon the engines began running out of gas. With only one engine still running, they crashlanded in a farmer's field near Wittering, Sussex. Although their plane was a total wreck, Crew 904 did walk away in one piece. The Shalvoy Crew 618 was not so lucky. Shalvoy recalls thinking it was odd that the engines of the planes in front of him were backfiring. Later it would sink in that those planes were conserving gas while he wasn't. Low on gas, he was able to get SWEET CHARIOT across the Channel and attempted to land at a B-17 base at Bury St Edmunds. Seeing how B-17 bases have shorter runways that aren't long enough to land B-24s, the crew called ahead to let them know they were going to land at their base. The 94th Bomb Group immediately dispatched ambulances and emergency crews to await their arrival. As the crew approached the base, Shalvoy spotted high tension power lines stretching across the end of the field and decided to fly over them. Just as he cleared the power lines, the aircraft ran out of fuel and the right wing stalled, causing the aircraft to cartwheel and land in the field short of the runway. The entire crew had to be taken to the hospital. One died later. Three were sent back to the US as they required extensive care. The other remaining six men were returned to duty as each one recovered. The 492nd learned a hard lesson. As it turned out, Lt Smith had been right about the primary target. That wasn't Mulhouse after all but Belfort instead. Snavely was congratulated by the upper brass for not bombing when the identification of a target was in doubt. The Adams section got a pat on the back, too. Since they were with another group, their target was whatever that group's target was. Belfort was scheduled for bombing that day by another wing. It's very likely Adams hooked up with a group in that wing. Although Snavely eventually had made the right decision, the ordeal shook the the confidence his men had in him. First of all, ordering a second run at a target is almost like signing a death warrant because the aim of the flak guns gets better. Secondly, soldiers have a hard time following an indecisive leader. Had Snavely made a quick call as to drop there or run off to another target, his men would have respected that. This one moment drove a wedge in his command. The problem encountered with the B-17s during assembly should had been a red flag, but it was written off as someone not being where they were supposed to be. Little did anyone know but the assembly paths designed for the 492nd and this B-17 group actually overlapped. That B-17 group was supposed to get a new flight plan to make room for the incoming 492nd, but they never received it. This error would cost the lives of an entire crew later on. What the Group didn't know was the mission's other objective, which was to sell Hitler on the idea that the Allies were going to invade the southern coast of France. See "The Bigger Picture." They accomplished that just by trying to bomb inside the Belfort Gap. So the day really wasn't a waste after all.